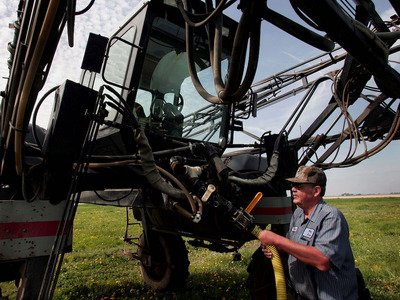 Photo by Scott Olson/Getty ImagesFarmer Terry Petry loads herbicide into a sprayer in Illinois. A new study of nearly 69,000 French people revealed that those who ate more organic foods had fewer cases of some deadly cancers. But people who choose to eat organic products might be less likely to develop cancer for other reasons that aren’t related to organic food consumption. More research is needed to determine whether conventional pesticides play a role in cancer risk. Organic produce doesn’t come cheap. Fruits, vegetables, meats, and dairy that are certified organic can be 25% to 100% more expensive than the non-organic varieties. It’s tough to know whether the steeper price is worth it for your health, since the merits of buying organic have been a subject of debate for years. But a new long-term study aims to shed fresh light on whether eating organic food could lower your risk of developing some deadly cancers. 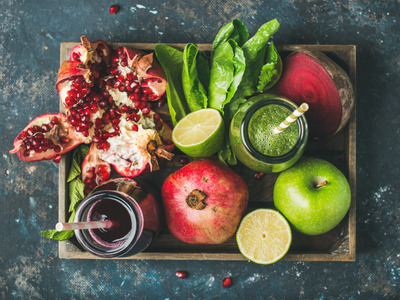 A study of nearly 69,000 French people published Monday in the journal JAMA Internal Medicine found that individuals whose diets were rich in organic foods of all kinds, including fruit, vegetables, nuts, meat, dairy, legumes, coffee, wine, and tea, may have slightly less risk of developing breast cancer and non-Hodgkin lymphoma than people who don’t buy organic. For the study, researchers looked at what French consumers (mostly women) said they ate on a regular basis over seven years, from 2009 to 2016. They compared that data against new cancer cases in the group, and found that study participants who ate the most organic food had 0.6% less cancer overall. That’s a small but noticeable difference. The link between eating organics and cancer risk was especially apparent when the researchers looked at cases of postmenopausal breast cancer and lymphomas like non-Hodgkin Lymphoma (NHL). For example, study participants who said they ate the least organic produce (the bottom 25%) developed 69 cases of postmenopausal breast cancer over the study period, while those who ate the most organic food (the top 25%) had 50 new cases. For NHL, the numbers were 15 cases and 2 cases, respectively. The researchers behind this new study noted that less than one in 10 pieces of European organic produce carries pesticide residue, while nearly half of conventional produce has some leftover bug-killer on it. But because this was a purely observational study, the researchers cautioned that more conclusive research is needed to know whether conventional pesticides have any measurable effect on cancer risk. Plus, standards and regulations for organic farming are different in Europe versus the US. Interestingly, non-Hodgkin Lymphoma – one of the types of cancer highlighted in the new study – is the type of lymph node cancer that over 300 US farmers are suing pesticide-maker Monsanto over in California federal court. The farmers claim that the weed killer glyphosate, which is used regularly in farms and gardens around the world, caused their NHL. Monsanto, meanwhile, argues that those claims are based on flawed science. Studies so far on glyphosate and its potential cancer link haven’t pointed conclusively one way or the other. More rigorous study of the chemical and its effects on humans is needed. A 2014 study of more than 600,000 women in the UK also looked at the link between organic food and cancer risk, and found that the eating organic did not reduce cancer risk except possibly in the case of NHL. But there’s another reason why researchers can’t tell for sure yet whether going organic lowers cancer risk. Organics in France typically cost 25% to 35% more than conventionally farmed goods, according to the UN Food and Agriculture Organisation. So it’s not surprising that the people who consumed more organic produce in this study were also likely to be richer and more educated than the other participants. Scientists have noted for years that power and wealth can help protect people against developing deadly diseases including cancer, so the fact that organic eaters in the study also had higher incomes throws other variables into the mix. Organic eaters in the study were also more active and less likely to smoke, two traits that are also linked to better cancer outcomes. Plus, participants who ate organic also had healthier diets overall – they consumed more fibre, fruits, veggies, nuts, and legumes, and less processed and red meats (which can raise a person’s cancer risk when eaten regularly). Scientists are pretty confident that eating more fresh produce of any kind – conventional or organic – boosts your health and can help reduce the risk of aggressive breast cancer tumours. A 2012 analysis published in the journal Food and Chemical Toxicology estimated that about 20,000 cancer cases could be prevented every year if Americans just ate additional servings of fruits and vegetables each day. That research suggested that no more than 10 cancer cases per year would be caused by the extra pesticides that come with those additional servings of fresh produce. “Consumers should not be concerned about cancer risks from consuming conventionally-grown fruits and vegetables,” the authors wrote, arguing that the benefits of eating fresh produce greatly outweigh the risks. Conversely, more and more scientific research is finding that eating a lot of red meat, especially the processed kind, as well as junk food like processed cakes, chips, and frozen dinners can increase a person’s cancer risk. “An overall healthy nutritionally diet, whatever the farming system, as well as high physical activity, are important documented protective factors against certain cancers and other diseases,” Julia Baudry, the new study’s lead author, told Reuters. In other words, the most important takeaway should be to buy whatever farm-fresh produce you can afford. If you are concerned about the chemicals that might linger on the surface of your produce, a simple solution of baking soda and water can wash away at least two common pesticides that are typically used on apples. Just soak the fruits for about 12 to 15 minutes.